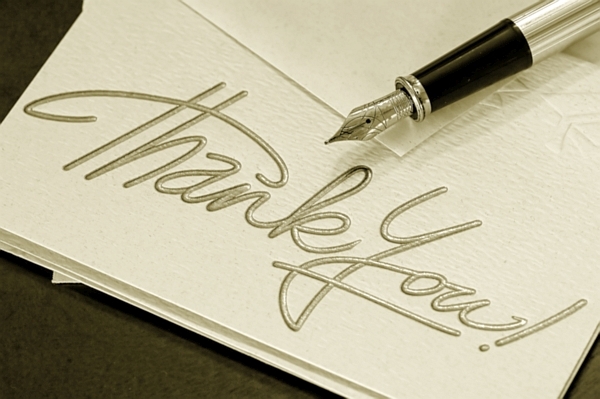 When was the last time you received a personal thank-you note in your mailbox? I was reminded of the impact saying thank you can have during the Lake Institute on Faith and Giving’s 12th Annual Thomas H. Lake Lecture. Dr. Christian Smith of Notre Dame presented some of the findings of his Science of Generosity Initiative. During the panel discussion following his lecture, he reminded the audience of Penelope Burk’s research on the power of the thank-you note. Every Christmas morning as a child, in the mad rush to the tree and the presents beneath, there was always a new package of Thank You Notes waiting for me in my stocking. That very afternoon my mother expected notes to be written to grandparents, aunts and uncles, and family friends who had helped spoil us that day. It was true then, and it’s still true now. Writing a thank you note is the right thing to do, pastors. For those who support your ministry and the ministry of your congregation through gifts of time, talent, and yes, through gifts of treasure. As it turns out, a well-written thank-you note can inspire a church member to engage even more fully with their faith and their commitment to their own calling as a child of God. A decade ago, Burk demonstrated the power of a simple, personal thank you letter to donors. Her findings were included in her book, Donor-Centered Fundraising. Here’s the executive summary – organizations that sent timely, personal thank you letters to donors realized greater gifts in the future. Burk demonstrates that something very important happens when we receive a thank-you note. Our souls are stirred, waves of positive emotion flow over us, not to mention beneficial chemicals in our brains. All of this conspires to inspire our motivations to do even more of what we were thanked for. That may mean more donations, more time, more thought – whatever it is, a thank-you note will redouble our enthusiasm. But there’s more – it benefits you too! You get a personal benefit when you write a thank-you note, too! Dr. P Murali Doraiswamy, of Duke University, discovered that saying “Thank You” releases the “reward” chemicals in our brains – dopamine, serotonin, and oxytocin – and reduces stress hormones like cortisol. In other words, saying “Thank You” actually makes you happier! Keep a running list in my calendar of people I want to thank. Every Friday morning, write to them. With practice, you can write ten notes (well-written) within an hour’s time. Maybe it’s worth an experiment. Can you devote 30 minutes a week for one month to write just three to five thank-you notes? Let me know how it goes, email me.